The ViewSonic Pro8200 1080p HD Projector is a dream machine for the true videophile. The Pro8200 makes beautiful, vivid pictures thanks to its Texas Instruments DLP DMD (Digital Light Processor Digital Micromirror Device) imaging panel with BrilliantColor. Unlike other technologies such as LCD that use just three primary colors to produce the image, DLP technology with BrilliantColor uses up to seven separate colors. BrilliantColor not only improves color accuracy, it brightens secondary colors as well. This combination increases the brightness of the colors by up to 50 percent over DLP projectors without BrilliantColor for accurate, true-to-life images. It makes all of its magic while drawing a maximum of 310W. In Standby mode it draws less than a single watt. That great color technology would be wasted, however if you couldn't back it up with strong specs and the Pro8200 has them. Start with the Pixelworks PW980 10-bit video processor which enhances color and detail. 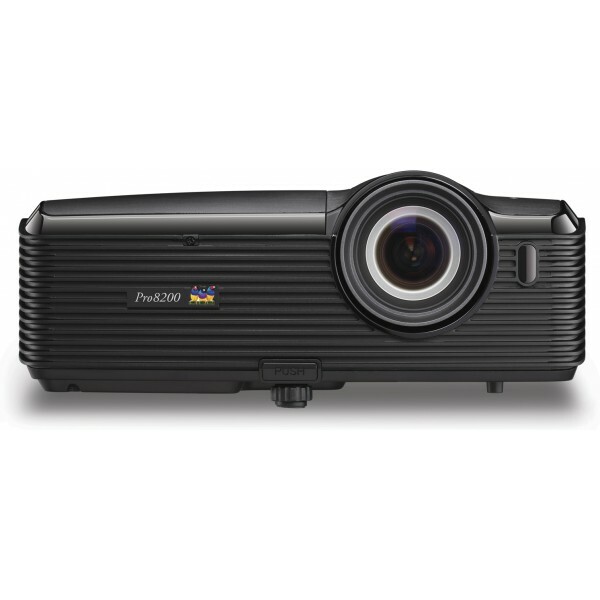 Add 1080p Full HD resolution, the highest standard available, and back it up with 2,000 ANSI lumens of brightness and a crisp 4,000:1 contrast ratio, and you've got a powerful projector that can meet the challenge of ambient light and absolutely blow you away at theater light levels. The Pro8200's wide connectivity includes 2 HDMI, component, composite, S-video and audio jacks. The microphone input coupled with the built-in 10W speakers is useful if you're using the Pro8200 for business or educational purposes or if you just want to serenade your audience at home. All of those great specs however, could be ruined by a noisy cooling fan. At 31dB the Pro8200's Normal mode is quieter than many projectors' so called "Whisper mode" and in Eco mode it hushes down to a barely perceptible 27dB while extending lamp life to 6,000 hours. All of this high quality projection power weighs less than 9 lb, operates on a 100 - 240V AC power supply and is compatible with NTSC, PAL and SECAM signals, making the Pro8200 a global citizen that's ready to travel if needed. Enjoy the finest quality in high-definition movies, video and TV. Crisp 2,000 lumen output makes this the perfect choice for family room or home theater. With full 10-bit color processing, detail enhancement technology and motion adaptive de-interlacer for crisper, sharper images. BrilliantColor technology delivers stunning all-digital clarity with life-like color, sharp graphics and outstanding video. The advanced 7-segment color wheel enhances the yellow color performance that is key to accurate and vivid color reproduction. Two HDMI 1.3 inputs with HDCP compliance and component video input provide full connectivity in a customized home theater installation. Supports multiple video timing formats from SD (NTSC, PAL and SECAM) to HD 1080p. Features not only a backlit full discrete IR remote but RS-232 control for seamless integration into your home automation entertainment system. Power, keystone, arrow keys, left, blank, menu, exit, right, panel key lock, enter, source.